Rittal Corporation, headquartered in Urbana, Ohio, is the U.S. subsidiary of Rittal GmbH & Co. KG in Germany and was founded in Springfield, Ohio in 1982. Its parent company, Rittal, was started in Germany in 1961 and has grown to include offices in more than 70 countries and manufacturing facilities on 4 continents. Rittal is built on a tradition of innovation and takes pride in a progressive approach to engineering comprehensive and effective solutions that support customers in pursuit of their goals. From a pioneering role in modular enclosure technologies and collaboration in developing what has become the standard 19-inch server rack for the IT industry, to the use of nanotechnology that drastically improves the efficiency of industrial climate control products, Rittal has a proven track record of meeting the challenges faced by its customers. 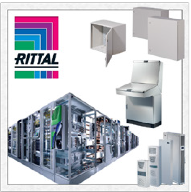 Rittal is the leading enclosure manufacturer in the world.